The Academic Internship Program at Bellevue College offers course credit to students who complete an internship or similar professional experience. This program is open to all BC students—transfer, prof/tech, continuing education, developmental, ABE/ESL, and baccalaureate students can all participate. We help students locate all types of experiential learning opportunities: we assist science majors looking for research experiences; we work with pre-health majors seeking volunteer opportunities; and we advise students considering service programs like Teach for America and Washington Conservation Corps. 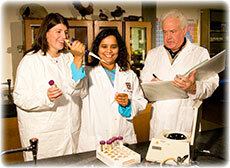 Given the scope of our work, we frequently work with faculty from all across campus. Indeed, faculty are crucial to the success of the Academic Internship Program. Many faculty discuss the importance of internships in their classes and encourage their students to visit the Center for Career Connections. Such support is vitally important to our program. An Internship Coordinator can visit your classroom to promote internship opportunities. He or she will take 5-15 minutes to describe the Academic Internship Program, share a few current internship opportunities, and answer questions. She or he can also offer valuable job market information and internship search advice. If you’ll be out of town at a conference or other event, we’re happy to fill in. We can teach a workshop on finding internships—and even customize it for your particular discipline. If you know of a company or community organization that might be interested in hosting an intern, please let us know. We will contact them to get the process in motion. It is very easy for employers to host an intern, and we are happy to explain our program to them. If you’d like, you can work closely with the employer and Internship Coordinator to develop a job description, identify potential candidates, and thus create opportunities for students in your program. If you know a student who is doing an internship or who has a professional volunteer position, please send them our way. We can help them earn academic credit for the work they’re doing. Our internship classes focus on professional development and help students turn an internship into a launching pad for their career. The internship program also provides professional liability insurance. The internship scholarship funded by ASG generally covers all of the tuition and fees for the internship course. At BC, internship credits are usually free credits. We want every student to apply their learning in the world beyond the classroom, and we don’t want cost to be a barrier. Provide information and leads about internships in your particular discipline or field. Attend advisory board meetings and work with your employer and community partners. Inform you (and your community partners) about the legal requirements and Bellevue College policies regarding the hiring of interns. Provide marketing materials for both employers and students. The Academic Internship Program is led by Chiew Jones, Associate Director for Experiential Learning (chiew.jones@bellevuecollege.edu; x4076) and Kimberly Martin, Internship Coordinator (kimberly.martin@bellevuecollege.edu; x2951). Do not hesitate to contact Chiew or Kimberly if you’d like to work with or learn more about the Academic Internship Program.